Established as part of the Tech Act/Assistive Technology Act, WATAP provides Assistive Technology resources and expertise to all Washingtonians with disabilities to aid in making decisions and obtaining the technology and related services needed for employment, education, and independent living. You can learn more about the ASSISTIVE TECHNOLOGY ACT OF 1998, AS AMENDED 2004 PUBLIC LAW 108-364 HERE. Every state and territory of the United States has an Assistive Technology Act program. Locate other state programs HERE. Many services are free or for a nominal fee. The lending library (for a nominal fee). Professional development. Trainings are offered for professionals as a fee for service. Technical assistance, help obtaining AT, …and more! 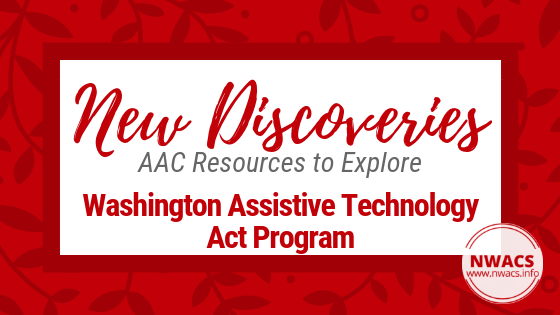 To learn more, and to start accessing services from WATAP, visit the Washington Assistive Technology Act Program website. And if you are attending the 2018 NWACS Fall Conference, look for an information table! A representative from WATAP will be setting up a table and will be onsite to answer questions.